Everyone knows salespeople have one of the hardest jobs around. But its not just how they act in front of customers and how good they are at closing a deal that makes a Salesperson great at their job. Salespeople need to crank through a mountain of busy work everyday so that they can actually spend time selling. What a lot of Salespeople don’t know is that the iPhone or iPad can automate a ton of the busywork. Juggle 4 different systems to schedule their day. Reps have to go between their calendar, customer notes, and CRM system while referencing a map to figure out where their customers are in relationship to one another. This is a huge time killer, because reps either spend a ton of time up front trying to figure out efficient routes to visit their customers or they waste time zig-zagging across town with inefficient routes. The need to use their laptop on the road instead of having access to the information they need right from their iPhone or iPad. For example, many reps are not able to update their CRM from their mobile device. Respond quickly to schedule changes. Everyone has had customers make last minute changes or cancel meetings; with the right tools, reps can adjust plans in real-time to avoid wasting time waiting for their next appointment. 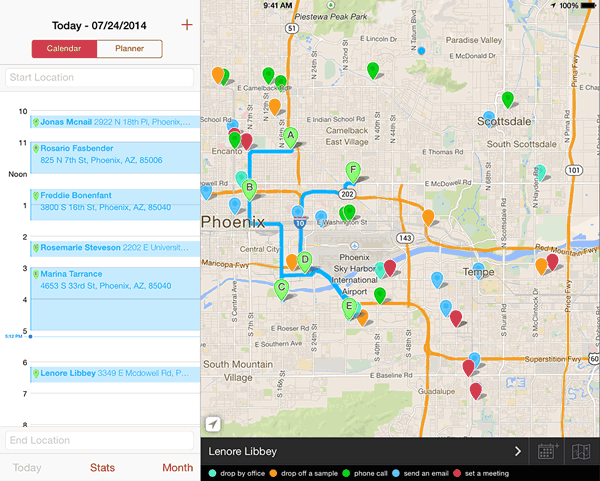 Not being able to organize your sales route to minimize drive time. When reps are driving across town or across the state, they want to maximize the number of customers they can meet with along the way filling in as much time as possible between meetings. If reps can see and work with all their customer data on their phone, kind of like the way they can already use Yelp or Google Maps but with their customer data, they will save a ton of time and effort. It turns out there is an app that attacks these time wasters for outside sales reps, the Badger Map. They offer a free trial, so its worth checking out to see if it could help save you time. Also, for every friend or colleague that you refer who subscribes, Badger will send you $50. Click here to get your free trial. For over fifteen years, Steve Benson has been professionally active in sales – as an inside sales person, an outside sales rep, and as a sales manager. Steve Benson is a founder and runs Sales and Marketing for Badger Maps, Inc., a software application for sales people to build a schedule and automatically route their calendar on their iPhone or iPad. Badger is a software company focused on providing the tools and applications for sales reps to be more efficient and effective in the field. Badger has a unique application, the Badger Map, which enables the sales team to manage their territory by combining Google Maps, data from the CRM, schedule planning, route optimization, and lead generation on the sales person’s mobile device. Badger offers the best software mapping solution to map customer accounts and sales routes. The Badger blog contains discussions of topics of interest to Sales Reps who are interested in sales map software and route optimization.